I hate when I feel lost. I feel sick when my future in thick fog. Today I find myself still looking for somewhere to move to although my current tenancy contract will expire in 3 weeks. Room hunting is not the only thing I can’t see the future of it. I’ve no clue how my mid-30s career move to illustration will pan out. I joined in online dating sites at the beginning of the year but it’s going no where. I love kids so one day I want to start my family but it seems like a far-fetched dream. My friends are settling down gradually moving out of London. How long can I keep up my life in London? In UK? What about my ageing mum who lives in Japan? Who’s going to look after her in the future?? Now I want to throw up. I’m a born worrier. (I wish I was a born warrior.) I easily get overwhelmed by small worries and let it physically affect me. But at least I’m learning to use this dark feeling to fuel my creativity. 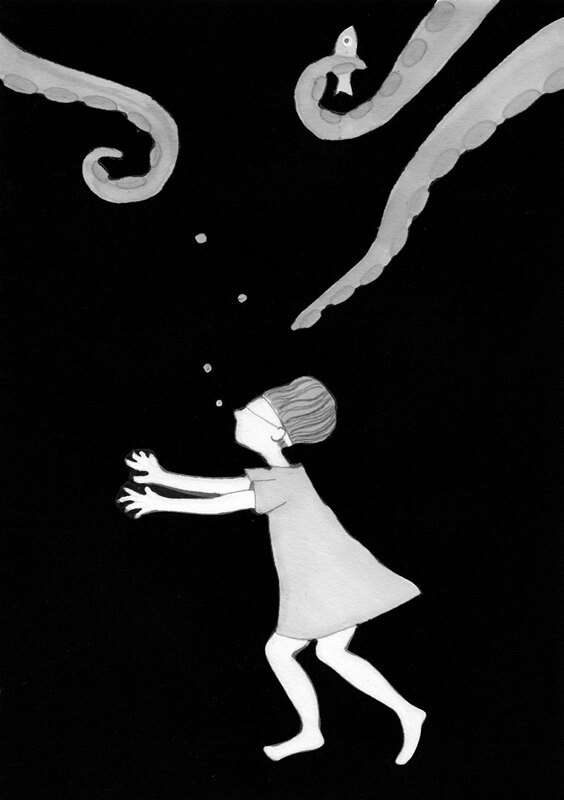 This is a story I wrote and this is the story behind one of the illustrations in my zine Emma. Emma sits on a bench in the park in her neighbourhood. It is a beautiful summer day. The sky is blue and high and the sun is beaming. Emma likes the park. It has plenty of green space and pretty flower beds. These flower beds bloom delightfully at this time of the year. Particularly today the place is lively with kids running and screaming with delight, parents chatting and gossiping, and the young and the old trying to absorb the precious sunshine as much as possible. The sun continues shining, so brightly that it begins to wash out all the colours in the park. Then Emma feels this strange yet familiar sense of disconnection; her eyes see all those colours of life but her brain does not register them; and her skin feels the warmth of the sun but under the warm skin she is filled with the dark icy water and she is drowning inside. Emma takes out her diary. One of the things that scares Emma is the blank diary. She likes to fill her diary with plans. It gives her a sense of direction, like the light at the end of a dark tunnel, and connection to the world. But when she opens her diary under the bright sun, those empty pages stare back at her with ghostly glows. She feels lost and alone.